One of the reasons I love my job is the relationship I build with my clients. 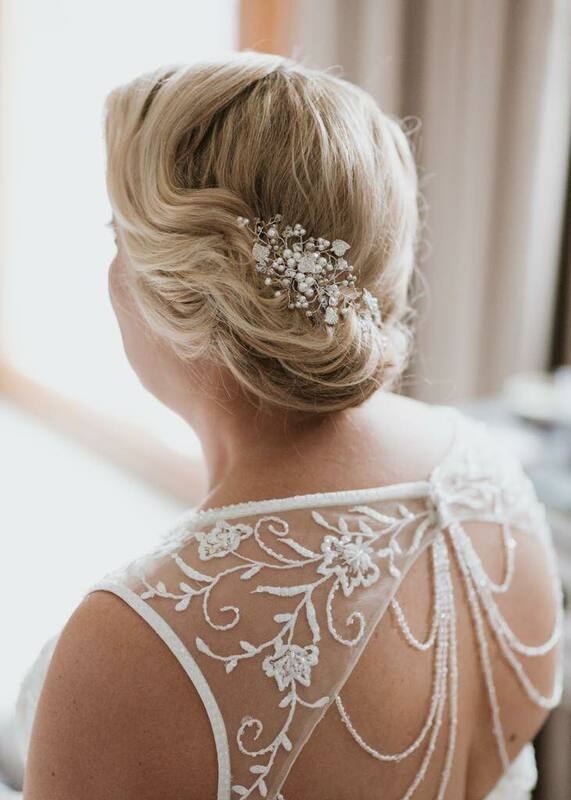 Styling someone’s hair on the morning of the biggest day of their life means being involved in some very special moments – meeting their closest friends and loved ones, sharing a laugh and helping to calm any excited nerves. 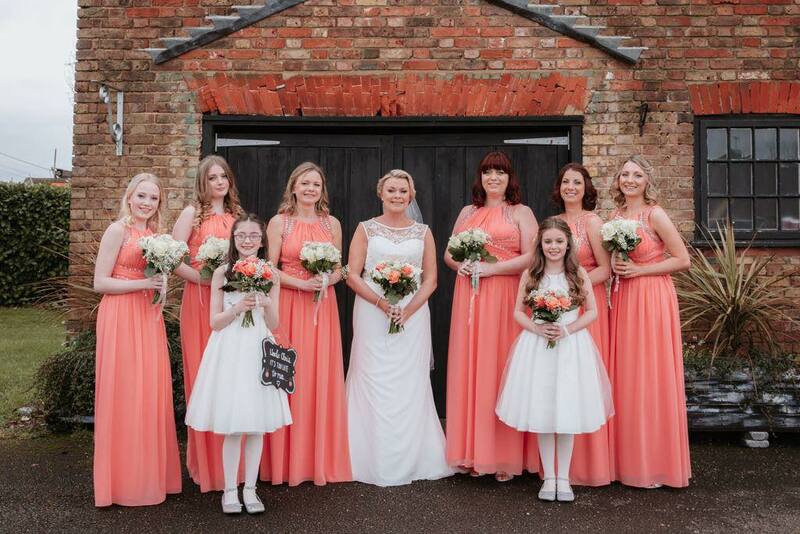 It’s always an honour to be involved in a wedding, but it’s particularly wonderful when I make a real connection with clients, seeing them as bridesmaids first, and then brides as they get married themselves. This is how I came to style a whole family’s hair, and how these lovely sisters became more like friends than clients. I first met Kate at The Lawn wedding fair in Southend, 10 years ago. My services had been recommended to her by her neighbour, the lovely Emma (a previous bride of mine). Kate decided to book me for her wedding taking place in 2009. 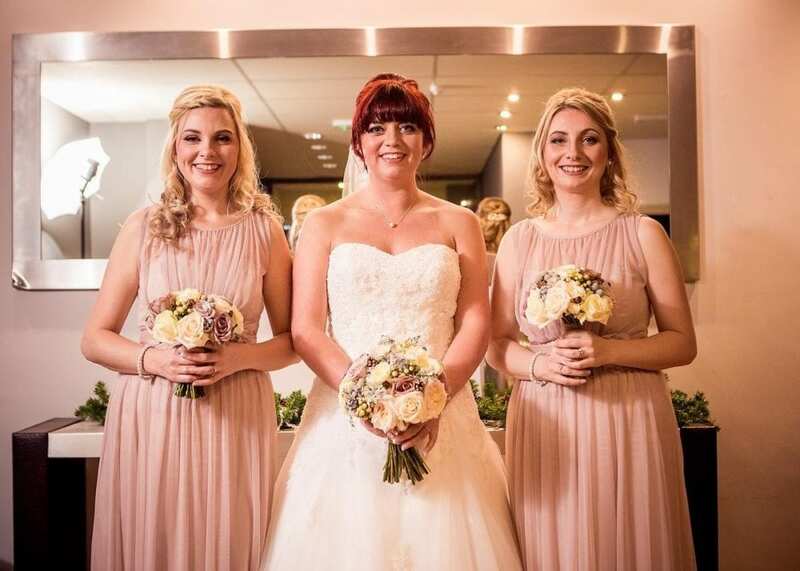 At her trial, she brought her gorgeous bridesmaids – her sisters Michelle and Stacey. 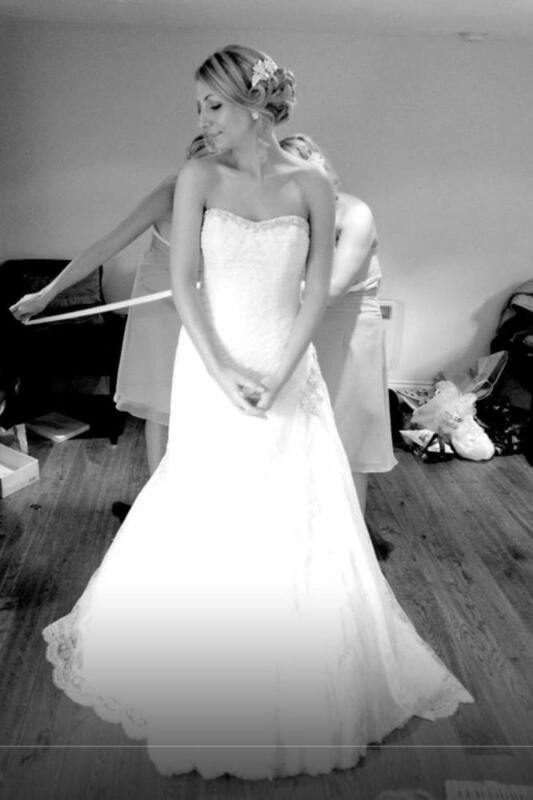 I got on brilliantly with all three girls, and really looked forward to styling their hair on Kate’s wedding day. Kate’s wedding at The Lawn was a stunner. She’d gone for a classically romantic half-up, half down style. Ten years ago, the sort of bohemian-inspired looks that are so popular now weren’t often seen, but I love the softness of this style – doesn’t she look beautiful? While I was styling her sisters’ hair, we got chatting about their love lives. Michelle said she absolutely loved the look I’d created for her, and that she wanted to use me for her own wedding, whenever that might be. Stacey laughed and said that in her case she hadn’t even found a man yet, so a wedding was likely to be a long way off. I said goodbye after a lovely morning, and wondered whether I’d hear from them again. Fast-forward three years, and an email appeared in my inbox from Michelle. 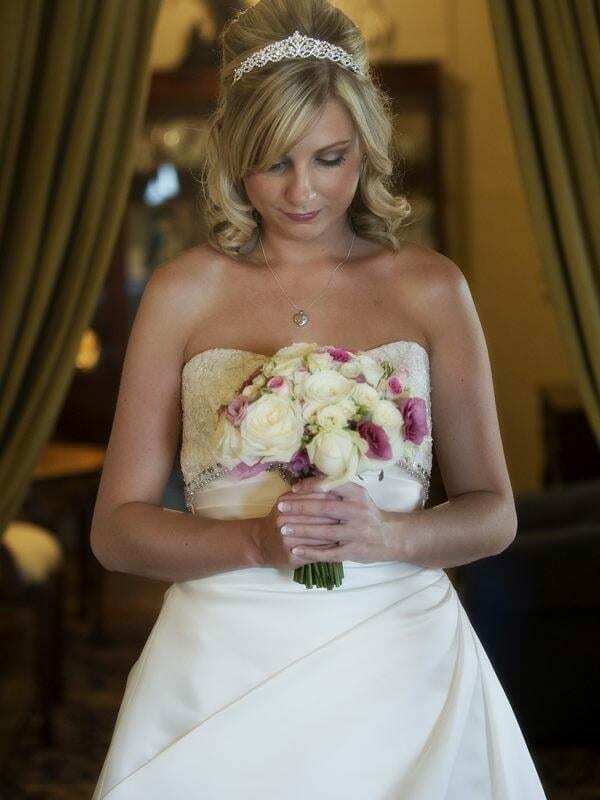 She was engaged, and planning her wedding for May 2013. She asked me to style her hair, and that of her bridesmaids. I was so happy to hear that I’d be working with Kate and Stacey again as well as Michelle, and this time I would also be styling their family friend, Sarah, too. I felt really welcomed by the family at Michelle’s wedding, which took place at Vaulty Manor. This wedding was a particularly special one for me, as it was the first one I worked on after the birth of my son, who had arrived 6 weeks earlier. I felt very lucky and happy to be surrounded by friendly and familiar faces. After Michelle’s big day, we all became Facebook friends, so I knew when Stacey had got engaged. I kept everything crossed that I’d hear from her about her hairstyling, and was over the moon when an email popped up a few weeks later. Stacey messaged me before she’d even confirmed the date and venue for her wedding, as she was so keen to have me involved. She told me that she couldn’t imagine the day without me, and I must admit I get a lump in my throat even now thinking about it. I was seriously touched, and so happy to be styling the sisters again. Stacey went for a modern and slightly edgy interpretation of a 60s beehive for her wedding at Rochford hotel, and I also got to create looks for Kate, their lovely mum and the equally lovely Sarah, who was bridesmaiding for Stacey as she had for Michelle. We all had such a giggle together and it really felt like they were friends rather than clients. Last but not least, it was the turn of the gorgeous Sarah. She came to see me at the Lawn Wedding Fair in September 2017 and booked me there and then for her wedding in March. By this time, I’d moved house and opened my bridal studio for trials, so it was lovely to be able to welcome Sarah, Kate, Michelle and Stacey into my new space and show them how my business was growing. Sarah chose a soft and natural up-do with a vintage feel to it, and she looked just beautiful at her early spring wedding at The Rayleigh Club. It really did feel like I was styling old friends as I worked on Sarah and her bridesmaids – not like work at all! These weddings have spanned a full decade, and I feel grateful and proud to have been invited to take part in each one. 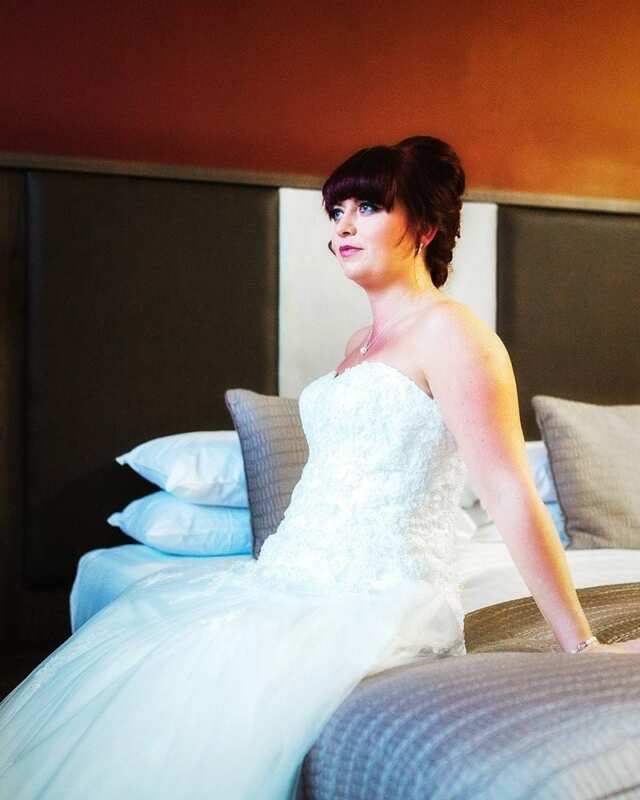 If you’re planning your wedding in Essex and the surrounding areas and looking for natural, beautiful hair styling with a whole lot of heart, then I’d love to hear from you. Get in touch, and let’s have a chat.